Irrigation channels have helped farmers in Uailili in Timor Leste to grow more produce. 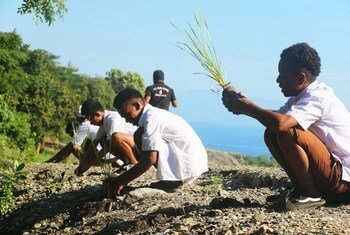 A new generation of green infrastructure which boosts the local economy, ensures water supplies and protects the environment is being built in Timor-Leste thanks to the support of the UN Development Programme (UNDP). A range of small-scale projects including new roads, bridges, drainage canals, irrigation and water supply systems, as well as flood protection structures, have been undertaken across the South East Asian island nation. Crucially, the infrastructure is able to withstand increasingly frequent extreme weather events like flooding and landslides which may be due to climate change. Read more here about what the UN is calling “climate-proof” infrastructure in Timor-Leste.